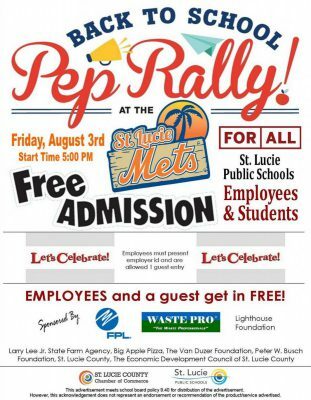 St. Lucie Public Schools Student Assignment Office will operate temporarily from the Treasure Coast Public Safety Complex to support the back-to-school needs of parents, students, and community members (August 1 – 13). Please make note of this temporary location: 4600 Kirby Loop Road, Fort Pierce. Attention Parents with VPK Children (age 4 by September 1). SLPS has a few remaining openings for the 2018-2019 school year. Affordable full day program taught by certified teachers. St. Lucie Public Schools is providing information and hiring opportunities for qualified individuals interested in teaching and substitute teaching. Mark your calendar for August 1st! SLPS sends a special thank you to all event sponsors!